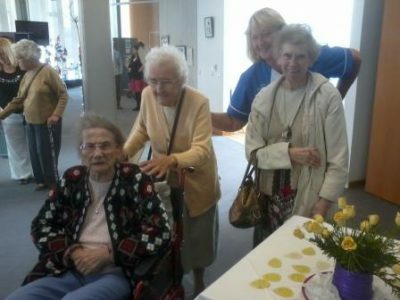 The University of Sheffield has led the development and coordination of a dementia creative arts exhibition in South Yorkshire since 2009. The exhibition is intended as an annual opportunity to showcase the creative talents of people with dementia and all affected by the syndrome. Each year a theme is decided by the organising committee – in 2016 it is ‘The Senses’ – and from this publicity material is created. This year, a competition was held among Art and Design students at Barnsley College to create the exhibition image. The value of the exhibition is three-fold. First, it provides a focal point for art activities coordinators (our most important partners) in 100+ care homes to work with residents to produce original creative outputs. The time spent engaged in creative activities is enjoyable and fulfilling. Second, the creative art is displayed during exhibition week in publically accessible spaces. An environment that is friendly and welcoming is guaranteed for artistic people with dementia and others with support of partners from the University of Sheffield student body and others including, in recent years, Social Work students on placement with AgeUK. Everyone is guaranteed a warm welcome. The third area of value is in the sense of self-esteem and accomplishment artists feel when they come to visit a public exhibition of their work. When people develop dementia there are many things that happen, including a reduction in social participation and the danger of focusing on personal losses. Participation in the exhibition is a success, an achievement and a precedent for new ways of living with dementia, for everyone concerned. Details on older people's involvement: Most but not all people with dementia are aged 65 years and above. The people with dementia and others affected by dementia are at the heart of this event. It is their talents, their skills and their application and engagement which make it possible for us to host an exhibition of their work. That the vast majority of people who contribute to the South Yorkshire Dementia Creative Arts Exhibition gain posiotively from being involved. Yes. I have recently returned from Cape Town where Dr Celeste De Jager at the Institure for Ageing in Africa has agreed to coordinate a similar exhibition in Cape Town. In addition, a sister exhibition to The Senses in Barnsley 2016 is being organised for Detroit in June 2016, with artwork created by US based people affected by dementia going on show to the public. We all aim to learn from each other from these events in different parts of the world. I have authored an article in the Journal of Dementia Care in 2014 which covers much of this topic. Again, the article in the Journal of Dementia Care in 2014 covers much of this. The main challenge, however, is to reach out to all people with dementia who might want to take part. Care homes vary in their management, enthusiasm and resources for creative activities. The exhibition relies on the creative talents of such residents, among others, and so getting 'into' the care homes and establishing a line of communication with an enthusiastic partner is key, and an ongoing challenge.